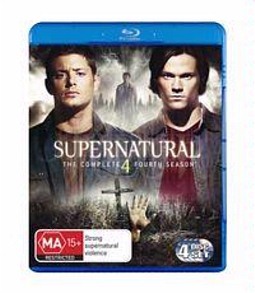 Season four of Supernatural finally arrives on the definitive format of Blu-ray that once again reunites viewers with demon hunting brothers Dean (Jensen Ackles) and Sam (Jared Padalecki). Although Supernatural is full of stereotypes and clichés plus it doesn't help that the two main characters look like models, contrary to popular belief, Supernatural is actually a well written and made series. After fighting an almost never ending hoard of demons, ghosts and just about everything and anything that goes bump in the night, the Winchester brothers are still fighting the hard fight. The main theme of series four is the powerful demon known as Lilith (Katherine Boecher) who is attempting to free her master, Lucifer (Mark Pellegrino) by destroying 66 seals. But when the brothers learn of this nefarious tactic, they soon realise that they are almost quite powerless to stop this creature. Fortunately they find assistance through a strange individual called Ruby (Genevieve Cortese) who happens to be a fallen angel and even though she agrees to assist the brothers, she has other agendas that may eventually cross paths with what Dean and Sam want. Similar to X-Files, Supernatural is not just one long story, rather most episodes are standalone which assists in giving you a break from the main theme of Season Four as they continue to send these evils back to the hell hole they crawled from plus a healthy dose of characterisation along the way. Compared to previous seasons, season four truly transcends the previous seasons and the scripting is very enjoyable. The stars of Supernatural, besides the special effects are Ackles and Padalecki who really get into the minds of each of their characters. The relationship between the brothers is a joy to watch as not everything is black and white, with each having a different way of handling the challenges they fight and like previous seasons, there's lots of bickering along the way. Unfortunately not everything is perfect in Supernatural and some of the stories are a little dry and boring but the majority does succeed and provide viewers with a fill-in for the gap that Buffy the Vampire Slayer left. Season four is definitely recommended to lovers of the supernatural but thankfully even if you have never seen the series, you can still enjoy the story and who knows, you may even want to go back and enjoy some of the past instalments. On Blu-ray, the video quality is stunning with 1080p that looks amazing, thanks to the extremely detailed sharp images, deep black levels and vibrant colours. Very impressive indeed. The sound matches the video well and best of all, the surround sound takes the audio to another level. The special features of Supernatural Season 4 are quite in-depth from commentary by producer Eric Kripke and writer Jeremy Carver, Mythologies of Supernatural, a 60-minute featurette, extended scenes and a funny 10-minute gag reel to round it out. At the end of the day, Supernatural may not reach the pop culture status of Buffy the Vampire slayer but for those looking for a decent sci-fi series, especially during this non-ratings period than there's far more evil Blu-rays out there than this. Recommended!